In the last Star Wars post, I explored why good triumphs in the original Star Wars trilogy. Now we must turn to the prequel trilogy to see how evil triumphs, or better put, why good fails. A brief look at literature and history would show that people critique evil better than they foster the alternative. Unfortunately for Anakin Skywalker, Jedi wisdom could better identify the path to the Dark Side than help him follow the Light. Nevertheless, the truth in Star Wars shines forth. Yoda and scripture identify the same path to evil. But how does one avoid it? See, Anakin loves people, and his love leads to worry. Yoda’s gives this warning in response to a boy worrying about his mother. Later, as a young adult, Anakin has premonitions of his mother’s suffering, but following Jedi wisdom, he does nothing until it is too late, and his mother dies. Not wishing to make the same mistake, when he has visions of his wife’s suffering, he acts recklessly, making a deal with the most evil man in the galaxy in an attempt to save her. This results in her death, and he becomes Darth Vader, the servant of the new Emperor. Although this unconditional love, which Christians describe with the Greek word “agape”, is more important than romantic love or “eros”, the Jedi understanding lacks the personal and relational aspects of love. Nevertheless, it makes sense that a religion with an impersonal “deity”, i.e the Force, would only espouse impersonal love. Of course, this advice does not help Anakin refrain from worry, nor does it keep him from foolish actions. What advice might the psalmist have given? God calls us to delight and desire. As life experience and other scripture passages teach us that God does not give us everything we want, we can instead interpret the above verse to mean God actually gives us desires as we delight in Him. Most importantly, we always have the opportunity to draw closer to the Lord, who can be our primary delight, whom we can never lose. 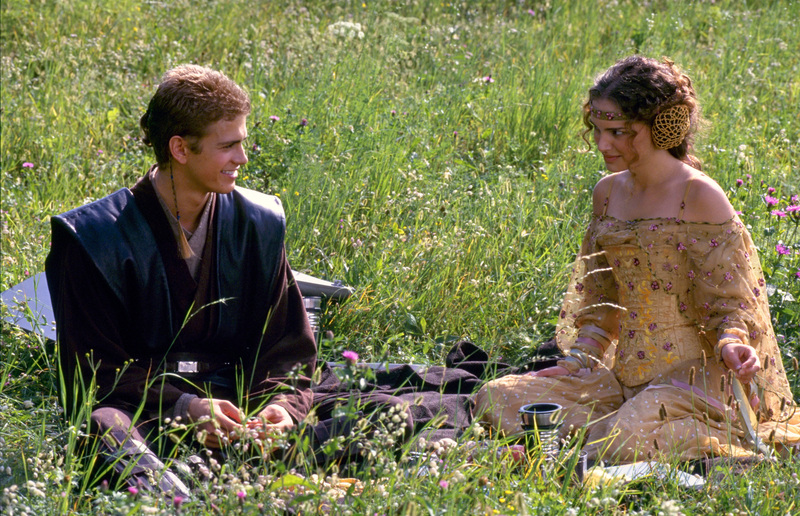 The Jedi failed to understand that we are relational beings and that we can only be truly satisfied in relationship. While Anakin intuitively knew this, he did not have the option of knowing the Force like we can know God due to its impersonal nature. Consequently, he placed his emotional well-being in his wife who can be lost, and then he lost her. Interestingly, Luke Skywalker has much in common with his father. He doesn’t only care for the cause, but also for his friends and even for his father. Approximately 20 years later, in Star Wars Episode V: The Empire Strikes Back, Yoda again discourages this thinking. When Luke fears his friends are in danger, Yoda tells him not to go and rescue them. Finally in Star Wars Episode VI: Return of the Jedi, Obi-Wan, agreeing with Yoda, tells Luke to kill Vader. 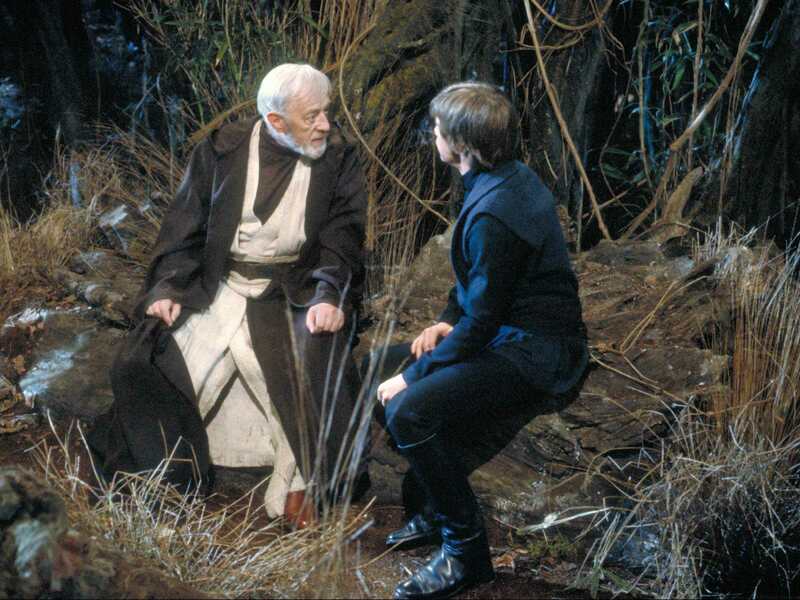 Luke’s personal care for his father leads him to choose death instead of killing his father. Finally, Vader’s love for his son, or in other words, his love for a family member becomes his path of redemption. Vader, true to his identity of Anakin Skywalker, turns on the Emperor and sacrifices his life to save his son. Although Yoda continually discourages Anakin and Luke from personal love of family members, this type of love (and the intense desire it embodies) saves Luke, redeems Vader, and defeats the Emperor, saving the galaxy. Imagine if the Jedi taught Anakin to embrace familial love in the context of having compassion for all people? More importantly, what if his heart was primarily satisfied in a loving relationship with a personal deity, which bolstered his love for family in an appropriate and healthy way? Do you have a desire that might pull you down a wrong path? Have you ignored it or tried to get rid of the “attachment”? If your desire is good, perhaps you should embrace it. Pray for it. Seek it. This does not mean we should disregard wisdom and only follow our feelings, but we can pursue our longings while being open to choosing (or receiving from God) a different desire. Ultimately, you are free to desire more, not less. I thought I’d devoted as much brain space as humanly possible to Star Wars, but you gave me something new to think about. Adam and I had an interesting conversation on the in/consistency of Yoda’s advice. Also I don’t know if you are taking requests but I’m interested in your thoughts on Avatar, Indiana Jones, and The Odyssey. Elizabeth, I’m always glad when someone thinks more about Star Wars! I’d love to hear about your conversation with Adam and your thoughts on Yoda’s inconsistency. Regarding author’s intent, I’ve found that an author may intend to say one thing, but they do so inconsistently. This seems to be especially common when Westerners try to present Eastern or pantheistic ideas. A Judeo-Christian worldview often leaks in anyway. Arguably, this happened in Star Wars regarding the benefit or harm of “attachments”, and I’m actually planning an entry on Avatar, showing the same phenomenon. And yes, requests are most welcome, and they will be considered! I’ll definitely post on Avatar sooner than I would have otherwise. I know it’s insanely late to reply to this, but I like your question regarding authorial intent. I tend to see authorial intent as the first part of a conversation. The rest of the conversation is up to the audience. It’s fun when we can know authorial intent, but it’s also fun to examine the work itself to see what it says, regardless of authorial intent. Along those same lines, it’s fun to look at common interpretations, but those are frequently useful as spring boards into new ideas about the work. I heard somewhere (I wish I remembered the source) that no person reads the same book. Everyone brings a different perspective to a book and will interpret it differently. That’s basically why book clubs exist. Also, this holds consistent with our blog. We write stuff with a certain intent, but it’s just the first part of the conversation. Just briefly on Yoda’s reasoning – the escape hatch in his logic is that the Jedi were trained from a very young age. Because of this reason he was initially opposed to training either Anakin or Luke, and when he grudgingly agreed – in the case of Anakin because of Palpatine’s political maneuvering, in case of Luke because he was the last hope – he tried to educate both of them into the same mindset as he would have done for toddlers. It was the only way the Force had been taught for thousands of years, afterall. Also, one could argue that there is sense in his logic in the larger scheme of things – trying to remove personal ambitions from those who were to become Jedi. Of course, this doesn’t affect the point of the blog with regards to Luke’s or Anakin’s personal experiences, just footnotes on the larger scheme of things. Janne, good point! It may be true that Anakin would not have fallen if he received training from a younger age. At the same time, it seems Luke succeeded precisely because he had so little exposure to the traditional teachings of the Jedi. If one could live well with or without desire, I much rather have a life full of desire and personal love. Huh, that’s very interesting. 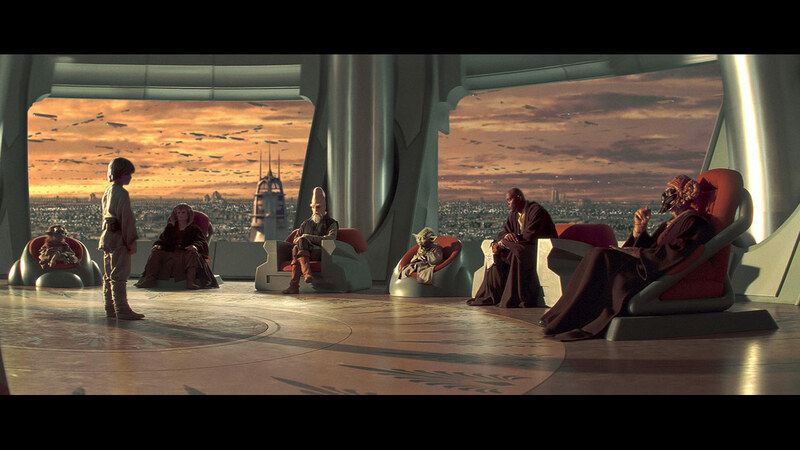 Extrapolating from that, one of the themes of the prequel trilogy does seem to be an implied critique of the rigidity and inflexibility of the increasingly hoary Republic and Jedi Order, and their resulting inability to respond to the Sith menace. It reminds me of a discussion I had with my church group yesterday, while we were trying to pick a new book to read. Since this was a 30s-50s married couples’ group, we were looking into books on marriage, but we couldn’t last a minute before collectively lamenting that a large proportion of the books in the “Christian marriage” subgenre seemed to be about “kissing dating goodbye” and “courtship, not dating,” none of which was very applicable to us. One of us then said (correctly, I think) that the best books he had read on marriage were all about communication, and that they weren’t necessarily part of the Christian marriage subgenre, since–surprise, surprise–Christians most certainly do not have a monopoly on good marriage advice. Which isn’t to say that there’s no place for “kissing dating goodbye”-type books; it’s just that there’s so much more to relationships than just that one aspect, and we were just struck by how much the Christian spiritual formation book industry spends so much effort teaching that one aspect of how romantic relationships work. I think a younger me, at least, would’ve benefited more from being exposed to multiple relationship tools so that I use for a wider variety of situations, rather just the one tool that was pushed so heavily. There does seem to be an inconsistency. Although the Jedi worldview (like many Eastern philosophies) values balance, the advice regarding attachments, i.e. “avoid them”, is very simplistic. A good mentor would show Anakin how to hold his desires for companionship and his compassion for the masses in a proper and healthy balance. As Above so Below … We are all connected through our DNA … so, we should also be letting go of our ” desires” by instead asking and trusting that we be given what is in our best interest as well as what is best for all concerned, since there is no time, and the Power above also wants the Powers below to be in harmony with all. What we desire for ourselves we also desire for all because what effects one effects all. Our DNA is made of star dust … We are connected at the very source. We are One and the Same. The closer we connect to nature the closer we connect to our God/Christ -Self, Mother/Earth-Self, Father /Sky-Self, Spirit /Soul-Self. God is not a seperate entity out there somewhere. God is within all of us. We are a reflection, mirror images of source. I may not be as familiar with bible text as some but I do know that somewhere it says we are made in God’s Image … Well then it stands to reason … As Above … So Below …. What about Star Trek The Next Generation .. will you be taking requests into the Spirituality and Quantum Relationship of time, space, and the universe ? I think this is a wonderful idea and I wish you the best in starting this new Blog. I look forward to reading more posts. Monica, thank you for your encouraging words and wishes! I’m glad you like the blog. Concerning the ideas of “Above and Below”, I hope to discuss the topic further when writing about Avatar. Thanks for commenting! You said you would be watching and maybe blogging about Star Trek TNG. What are your thoughts about the Prime Directive? About sometimes they used it as an excuse to do nothing. The Prime Directive, the policy to not interact or aid civilizations before they develop warp technology, is one answer to a very difficult question. How should a more technological (and therefore powerful) civilization interact with another? Human history is full of bad examples, as the former typically oppresses and imposes their culture on those less powerful. It is good that the Prime Directive forbids these actions, but it overcompensates. God calls us to help others, not just refrain from harming them. But, the Federation believes that their help would be harmful. Must it be? While it is wrong to arrogantly enter another society, assuming we can fix their problems, (which is another mistake the Federation avoids), we can learn from many good examples of our past and present. Many missions organizations and humanitarian agencies enter with humility, bringing solutions for urgent needs (like medicine) and help a society develop their own solutions to long-term problems in sustainable ways (like microloans supporting local entrepreneurs). At it’s core, the Prime Directive errs because it assumes that societies naturally improve themselves. (In this way, the Federation is filled with hubris.) Instead, Jesus’s spirituality maintains that we need help and that we must help others with what we have received. Though the Federation is not guilty of laziness or even apathy, Jesus’s words might still apply to them, “for I was hungry, and you gave Me nothing to eat; I was thirsty, and you gave Me nothing to drink; I was a stranger, and you did not invite Me in; naked, and you did not clothe Me; sick, and in prison, and you did not visit Me… Truly I say to you, to the extent that you did not do it to one of the least of these, you did not do it to Me” (Matthew 25:42,43,45). Though the Prime Directive is much, much better than imperialism, Jesus’s teaching and example—as He intervenes in our history and lives—far exceeds them both. One of the examples I’m thinking of is TNG’s “Pen Pals”. Data was corresponding with a little girl whose pre-warp planet was being destroyed by seismic activity. Yes, the crew of the Enterprise helped without revealing themselves, but they had to sit around and talk about whether they should or not. I don’t think they should be “what the h***” about the prime directive like nuKirk in “Into Darkness”. (although that was sort of funny, and the Enterprise rising from the water was very cool). I understand that interference can damage a lesser developed culture. But if one can help, preferably without revealing one’s self if the culture is going to be obliterated if you do nothing, what is the problem. You can’t get more damaged than utterly destroyed. Another one is “Homeward” in which Worf’s adopted human brother, anthropologist Nickolai asks Picard to save one village of a planet where they will all be destroyed if they did nothing. So Nickolai tricks Picard into helping. It may not have helped them in the long run. One village (where people may have already been related) couldn’t rebuild a whole society without running into genetic problems down the road. What are your thoughts on that one? Sorry for the delay. My wife and I have not reached this episode in rewatching the series, so I just viewed “Homeward” last night. Wow! It is the epitome of everything that is wrong with the Prime Directive! – Technologically advanced civilizations know better than others what is best for them. – Consequently, the technological civilization can construct a lie more helpful than the truth. – It is better to die than be told you are wrong. – The lives of less technological societies are less valuable, worth being studied but not saved. While critiquing the Prime Directive, I do not mean to criticize the show. I happened to notice that Ronald Moore produced this episode, and from his work on Battlestar Galactica, I doubt he shares Gene Roddenberry’s beliefs that technology and secularism would usher in utopia. Likely also disagreeing with the Prime Directive, a cornerstone of this utopia, the episode may have intended to push the rule to its breaking point, intentionally revealing its flaws. For me, the most striking thing about the Prime Directive is that it actually takes a very pessimistic view of human beings and their ability to wield power for good, which is an anomaly in Roddenberry’s otherwise very optimistic worldview. My guess is that the thinking behind the Prime Directive ultimately derived from the cynicism around the Vietnam War contemporaneous with the original series’ run, and distrust of how global superpowers manipulate regional proxy states. So I think there *is* some wisdom behind the Prime Directive, even in cases where a society is likely to fail without intervention, because human beings are always susceptible to corruption. That being said, I also think the Prime Directive is fundamentally un-Christian. While the gospel places a high value on community (living with any among others), neighborliness (loving others as we love ourselves), and incarnation (being and bringing the Kingdom of God into the present world), the Prime Directive mandates segregation off of arbitrary racial and “evolutionary” criteria. As an aside, one of my favorite Trek episodes is DS9’s The Quickening, which strikes me as presenting a more mature model of understanding intercultural power dynamics. Without spoiling too much, Dr. Bashir’s attitudes range from a reckless savior complex to despair at total powerlessness, before coming to a more nuanced understanding of himself and his motivations. I see this episode as both an embrace of the Prime Directive’s wisdom and a rebuke of its excesses, and I think what Bashir ends up having is pretty close to the community, neighborliness, and incarnation the gospel calls for. Mike, you bring some interesting points up. In the cases of Vietnam and Korea (and the conflicts of more recent times), it seems like the US is called on to act like the world’s policeman. Andrew, another point I think might be interesting in your blog about Star Wars. Have you ever watched a documentary called Star Wars, The Legacy Revealed. It’s about how the story-lines of Star Wars are influenced by history, religion, mythology, etc. One of the points brought up in this documentary is that the way Luke chose to deal with Vader (trying to save him because he loved him instead of defeating him by killing him) was like Christian philosophy. What do you think? Mike, great points! Also, I’ll have to watch the “The Quickening”. That might become a blog post. While I understand your point that the Prime Directive is meant to prevent the Federation from playing God, I find the opposite to be the case. In “Homeward” referenced above, it forces the Enterprise crew to decide how to construct a (false) reality for the planet inhabitants. Instead, they could come alongside the people, share truth, and allow them to make their own decisions. Tracy, thank you so much for telling me about the documentary! I will definitely watch it! And yes, Luke’s actions embody the Good News of Jesus. (In fact, I chose this topic for my first blog post: The Meek shall Inherit the… Galaxy). Luke would be justified in killing Darth Vader, just as God can punish us for all the wrong we have done. But, love motivates them to redeem rather than punish. Luke casts down his lightsaber, willing to die for the guilty party. Jesus sacrifices His life for us, experiencing the punishment we deserve. In response, Vader turns from the Dark Side, and becomes like Luke, now sacrificing his life. Similarly, when we turn to God, He transforms us into people who love like He does. This is God’s story of salvation plus cool spaceships! It doesn’t get much better than that! Andrew, I think you can watch Star Wars The Legacy Revealed in it’s entirety on Youtube. It was originally broadcast on The History Channel I think. If you do watch it, would you be interested in sharing your thoughts about in this blog. Thanks for letting me know that too. I’ll watch it soon. Hopefully, I can write a blog post on it, but if not, I’ll at least share my thoughts here. Thanks again! In order to not derail this thread from it’s original topic, I think the prequel era Jedi of Star Wars are much like the ones of TNG who think the Prime Directive is more important than the people they refuse to save. I’m talking of course about how the Jedi didn’t do anything to save Anakin’s mother. If for no other reason than to give him a little peace of mind. As far as they knew, she was still a slave on a brutal planet (even marrying a kind man didn’t keep her safe, but I think Palpatine might have arranged for that to happen). They knew he missed and worried about his mother. And made him feel like there was something horribly wrong with him for doing so. Yes, I think Ronald D. Moore was frustrated by the restrictions when he was writing for the different Trek series. I can understand that. However I have negative feelings about how he compared Battlestar to Voyager. Saying Battlestar was what Voyager should have been. Many people like Voyager just the way it was. I don’t know if you watch Star Wars Rebels, but Kanan Jarrus provides an excellent example of a balanced Jedi. He remains committed to the cause, but also his friends. He is in a healthy romantic relationship, and even seeks to help his apprentice find his parents. If Yoda and Obi-Wan had been more like him, Anakin likely would not have fallen to the Dark Side. I watched the documentary you recommended, Star Wars: The Legacy Revealed. I liked its thoroughness as it shows how Star Wars includes key components of myth (and quotes Joseph Campbell’s description of myth as “a metaphor for the experience of life”, not equating it with falsehood). While it frequently drew comparisons to Greek mythology, I noticed that it specifically connected Christian spirituality to the fall and redemption of Anakin Skywalker. I know I’m biased, but that’s the best part of the story! The documentary also highlights the recurring theme in myth of “man vs machine”, which I never considered deeply before. This is less about defeating robots and more about maintaining one’s own humanity, i.e. flexibility, graciousness, and compassion. In this case, “machine” could be a strict, totalitarian regime or an impassioned individual who merely does his role. This reminded me of a Biblical prophecy of the Messiah, identified as a “son of man” confronting tyrannical government depicted as a beast with “teeth of iron and claws of bronze” (Daniel 7). Jesus offers restored humanity to both the oppressed and oppressors. Similarly, Luke restores Vader— “more machine now than man”—who is manipulated by Palpatine to enforce his order. As I continue to contemplate the documentary, I’ll see if I have an insight that I can develop into a full post. Thanks again for the recommendation! You are very welcome. I liked the part near the beginning comparing both Anakin and Luke’s version of “The Hero’s Journey”. Also the quote by Linda Ellerbe near the end (and I think she was quoting Margerat Meade) about, “Never think a handful of committed people can’t change the world, in fact it’s the only thing that ever has”. Previous Previous post: The Meek shall Inherit the… Galaxy? Next Next post: Can the Evil Queen be Forgiven?